One of my secret pleasures is that I LOOOOOVE trashy reality tv shows and game shows about FOOD. So, naturally, I tuned in via Hulu last year for the season of Hell's Kitchen. Watching the wrinkled, orange, yelling mess that is Chef Ramsey parade around and tell people that their food is crap for an hour always help keep things in perspective. The 2011 season of Hell's Kitchen had an opening designed around a pinball machine. It's pretty surreal. I think this machine suffers from the same fault as the Gorfinator pinball machine from that issue of Robin that I took scans from (LINK); it falls into that "uncanny valley" of pinball machine design. Obviously, the animators for the above sequence knew the the basics about a pinball machine. "Uh, it's got flippers? And bumpers? There's two buttons on the side where you have to fast-paws slap it around?" It definitely reads as "pinball machine" but there's just something...off...about it. 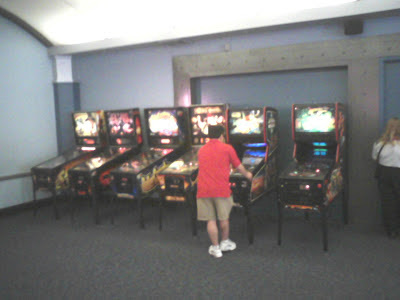 As some of you might remember, last year I went to Florida for Winter Break and found a bunch of pinball machines. Well, this year I went to Florida for Spring Break and found even more pinball machines! On Friday Claire and I took the train from Vermont down to Washington D.C. Unfortunately the National Pinball Museum has moved to Baltimore, so we couldn't play there. One of my previous students who now lives in D.C. (Josh Kramer of Cartoon Picayune fame) tracked down this pinhall in Fairfax, VA but it was pretty far out and we didn't have a car, so I wasn't able to check that out either. I kept an eye out while walking around D.C. but nothing turned up... the town was dry! The arcade ran on one of those card systems, which I am not a fan of. The first night we got in, the card machine was busted, so there was no way to play until the next day. The machine was in great shape (duh - it's brand new) and I had a lot of fun playing a familiar game. 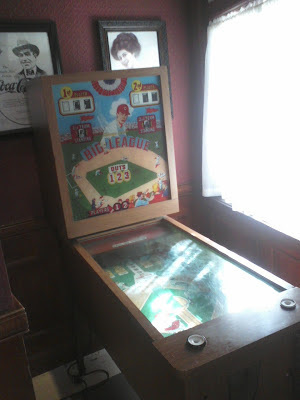 The next day in Disney World I found a few different interesting things... On Main Street USA, inside a "Casey at the Bat"-themed hot dog shop, there was a 1966 Chicago Coin Big League Baseball pitch and bat game. 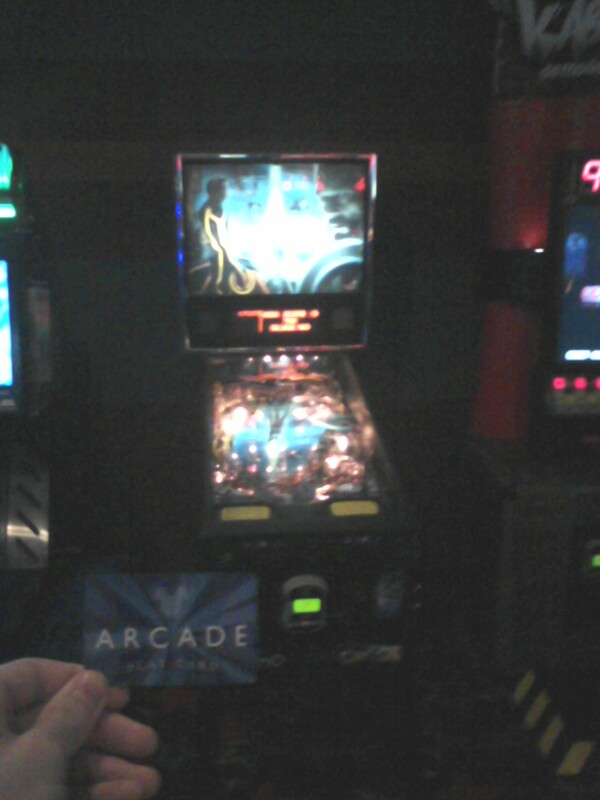 It was not working, and not technically pinball, but it was still cool to check out! My next find was by Space Mountain. After that roller coaster ride through the dark, I was ready to stand on my own two feet for a while, and luckily the ride let out into an arcade! Tucked away in one corner they had quite the pinball lineup! From left to right that's Indiana Jones (2008, Stern), Elvis, Roller Coaster Tycoon, Pirates of the Caribbean, Star Wars: Episode I (!!?!) and Revenge From Mars. Unfortunately, this fine collection of machines needed some love. SW:E1, Pirates, and Elvis all had extremely weak flippers (preventing the simplest of ramp shots) and the sound was completely gone on Revenge From Mars. 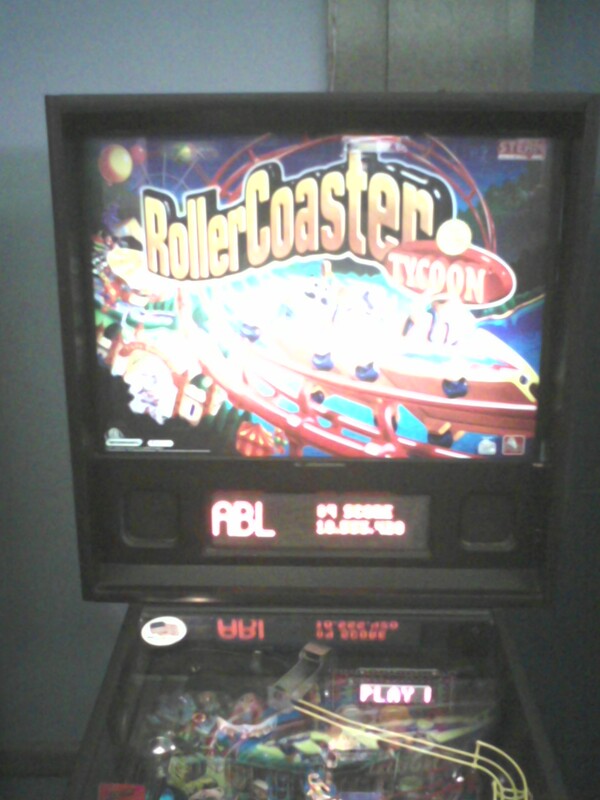 After one game on each of the beat-up machines, I focused my energy on Indiana Jones and Roller Coaster Tycoon. I had a very long game on Indy, but alas, the bar was set pretty high. I got a replay, but couldn't mark the board. I left my credit for whoever came along next. On Roller Coaster Tycoon I got the #4 score, with 10,555,420 points! Anyway, it was nice to see some pinball in the "happiest place on earth." It seems like Stern licenses Disney franchises pretty frequently (especially considering that Disney bought Marvel a few years back) so hopefully they will continue to buy pinball machines for their parks. Jon and I are chipping away on Drop Target #4, and we should have some exciting Drop Target news to share later this week! Ryan Claytor's First Pinball Machine! While emailing with Ryan, he told me that he specifically sought out this machine and waited until he found one. I think that's awesome. Jon and I bought whatever machines came our way (which has worked out quite well for us...) but I think on my next machine, I'll wait until I find the one I want. If I could have my druthers, it would be a Star Wars Epsiode I pinball 2000 machine. But any hunting will have to wait! 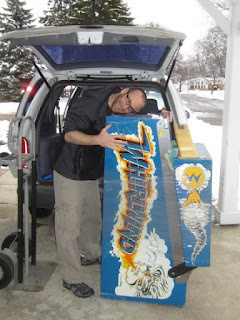 I'm getting ready for a cross country move, and it's going to be hard enough to move one pinball machine, without having to worry about more. Anyway, congratulations Ryan! We'll be watching your blog to see your new high scores and any repairs and/or refurbishments. 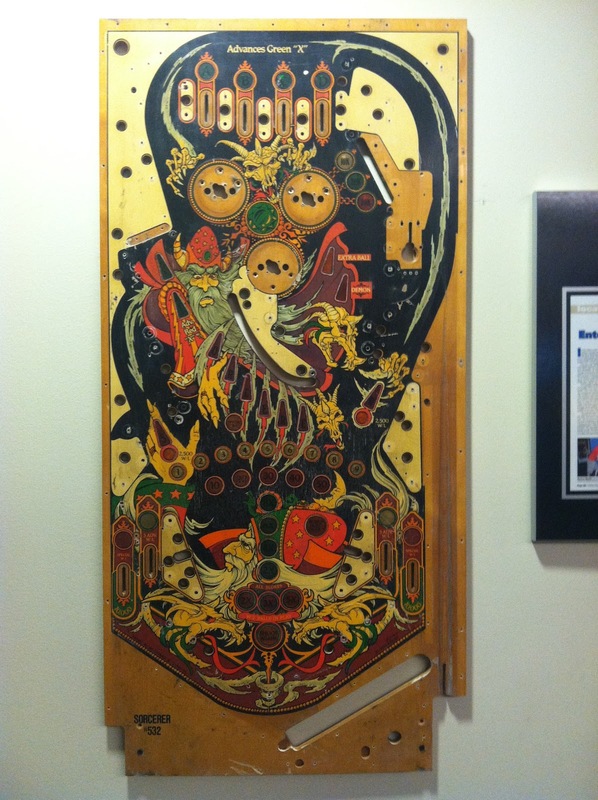 My friend Liz Prince sent me this awesome cell-phone photo of a playfield hanging on the wall of PINBALLZ in Austin, Texas. It's an amazing arcade in Austin that might have more machines than funspot (definitely more of the awesome ones). I was there again last night and I was thinking that this is probably a pinball destination that'd be worth traveling to for you. All of the games I played we're in excellent condition, etc. It definitely sounds like my kind of place! I'll have to check it out if I'm ever in Austin. It's Spring Break this week at CCS so I'm heading out on the road for a few days. As ever, I'll keep my eyes peeled for pinball machines out in the wild, and I'll report my findings here when I get back!